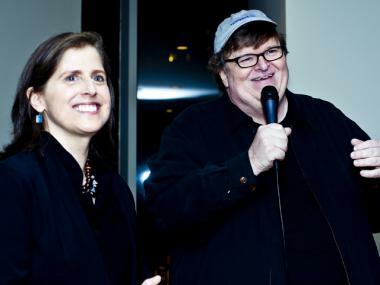 Upper West Side City Council candidate Helen Rosenthal with filmmaker Michael Moore at Rosenthal's campaign kick-off event in March 2012. UPPER WEST SIDE — The race for outgoing City Councilwoman Gale Brewer's seat in 2013 is attracting some star power. Filmmaker Michael Moore spoke in support of candidate Helen Rosenthal at a recent fundraiser, and candidate Ken Biberaj announced this week that he's hired veteran political strategist Hank Sheinkopf, who worked on President Bill Clinton's 1996 reelection campaign. Biberaj, a 32-year-old vice president at the Russian Tea Room, was the latest candidate to join the District 6 contest. Also in the race are attorney Marc A. Landis, who represented Upper West Side parents in their fight to keep a charter school from opening in a public school building, and Community Board 7 member Mel Wymore, who would be New York's first openly transgender City Council member if he won. Upper West Side City Council candidate Ken Biberaj. Brewer, who's represented the Upper West Side since 2002, plans to run for Manhattan Borough President when she terms out of her council seat next year. Rosenthal, a former chairwoman of Community Board 7 who previously worked in the city budget office, kicked off her campaign with a party at her apartment in early March. Among the speakers was Moore, who's lived in Rosenthal's building on Broadway and West 83rd Street for years, she said. Moore, known for his politically charged cinematic critiques of the Bush Administration and America's healthcare system, praised Rosenthal as a conscientious recycler and supporter of organized labor, Rosenthal said. "He was very funny," Rosenthal said. "He said he was here as my neighbor and that I was a great recycler. He said we should do everything we can to help Helen." Rosenthal said she's known Moore for years, and once connected him with local elected officials when he was raising money for Michigan politician Jennifer Granholm. Both Moore and Rosenthal are from Michigan. Rosenthal said Moore's support was welcome, but she was quick to point out that she's also received backing from local political legends like Ronnie Eldridge, who represented the Upper West Side on the City Council for more than a decade before Brewer succeeded her. Sheinkopf, 62, is also a New York politics power player. A consultant who's guided hundreds of candidates over a three-decade career, he's best known for his work with Clinton, Mayor Michael Bloomberg, Public Advocate Betsy Gotbaum and Comptroller Bill Thompson. "We're believers that new, young, spirited candidates are needed to revitalize New York City politics, and Ken fits that bill," said Andrew Moesel, director of political affairs at Sheinkopf Ltd.
Biberaj said he and Sheinkopf share the same vision for the Upper West Side. "[Hank] understands that right now the city is at a point where there are so many issues that aren’t being addressed, whether in education or for small businesses," Biberaj said. "I think he realized I was someone willing to roll up my sleeves and get things done." 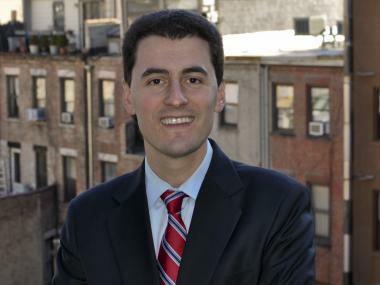 Biberaj, the son of Albanian immigrants, was born in the Bronx and graduated from Harvard University's Kennedy School of Government with a master’s in public policy. In 2004, he worked as Florida research director for Sen. John Kerry's presidential campaign. This is Biberaj's first run for public office.